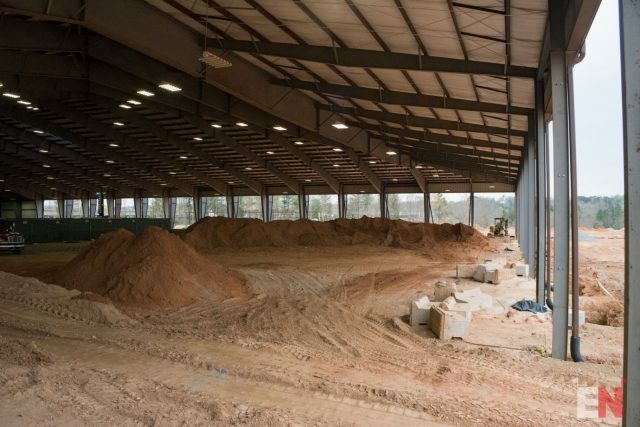 There’s a lot of red clay dirt being pushed around at Tryon International Equestrian Center. 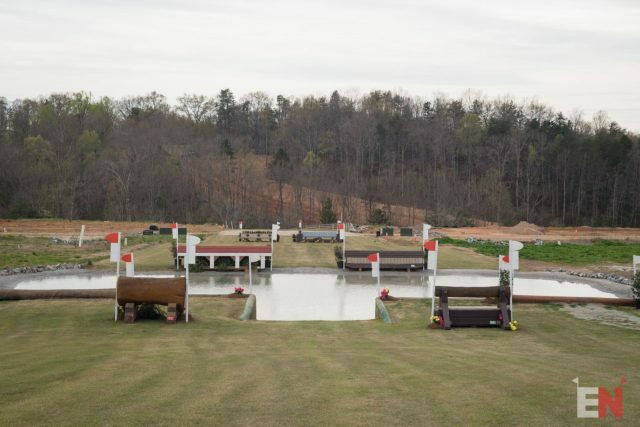 It rises up in jagged tiers behind the George H. Morris Arena, where CIC3* dressage and all levels of show jumping took place last week for The Fork and WEG Eventing Test Event. Giant bulldozers push it around on the venue’s periphery, piling it up or flattening it out, adding or subtracting layers of earth from burnt orange hillsides. Construction is underway for the 2018 World Equestrian Games everywhere you look: piles of rebar, stacks of lumber, steel beams, all earmarked for new structures. There’s a concrete foundation where a hotel is meant to be built, a three-story skeleton that will house a new media center and VIP hospitality decks, and a half-functional indoor arena. When TIEC is in use for horse shows — as it will be for 75 out of the next 153 days, roughly half of the time between now and WEG — work within the venue must take place at night. “Will it get done in time?” was the whisper on everyone’s lips during The Fork at TIEC. The absence of knowledge is always a petri dish for speculation, rumor and concern, but it’s rooted in a very legitimate question. Hosting all eight WEG disciplines within a central venue is a logistical Rubik’s Cube — in addition to some 800 human and equine athletes, plus officials and volunteers and all the other moving parts, the venue must accommodate half a million spectators over the course of two weeks. WEG is allegedly the largest sporting event in the U.S. this year, and the fourth largest in the world behind the PyeongChang Winter Olympics, FIFA World Cup and Tour de France. The infrastructure required boggles the mind. And objectively speaking, there is still so much to be done at TIEC, so much red dirt everywhere, and the clock is ticking. Is TIEC on track to host WEG? “It depends on what your definition of ‘on track’ is,” a TIEC spokesperson said when we pressed for an answer. At the end of the day, the only definition that matters is the one by which Mark Bellissimo, managing partner of Tryon Equestrian Partners, is operating. His bid to host WEG 2018 was accepted just over one year and four months ago, when only two venues were left standing after a fraught selection process: TIEC, and the Šamorín equestrian center in Slovakia. The timeline was expedited from the get-go and will remain so through the homestretch. Whether TIEC is on track to host WEG is for Bellissimo to know and for us to find out later — the proof is in the pudding, as they say. And not unlike TIEC at the moment, pudding can be messy. In the meantime, here’s a tour of TIEC as it stands. 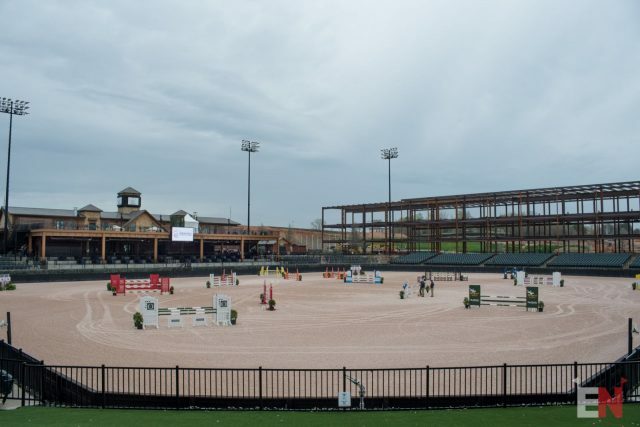 First, to orient ourselves, a panoramic view of the venue from left to right: the Derby Field, to the established “Tryon Village” and George H. Morris arena, to stabling, to the indoor arena and venue entrance. The area in the foreground will host the World Equine Expo, which includes a trade fair, demos, educational seminars, clinics, panel discussions, an equine art/film festival and the WEQx Games. A wayfinding firm will be brought in this summer to help connect the various parts of the venue and create signage to direct human flow. The 12-acre Derby Field will become the site of a semi-permanent stadium that will host eventing show jumping and the disciplines of dressage and show jumping. Cross country will also finish in the arena. 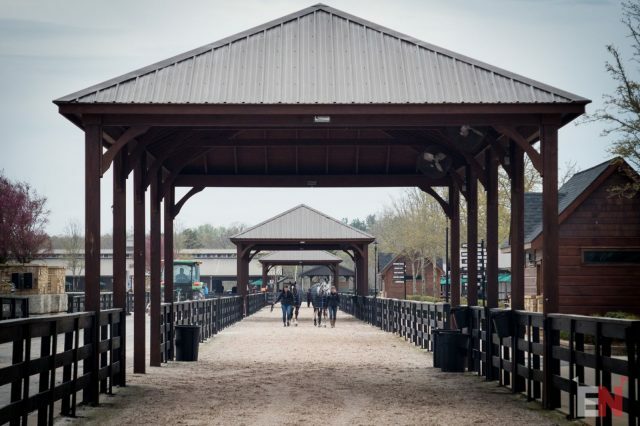 (Eventing dressage, which is nearly sold out, will take place in the George H. Morris Arena.) The new stadium will be similar to the one built in Greenwich Park for the London Olympics, built on a temporary platform structure with footing atop it and seating for 20,000. 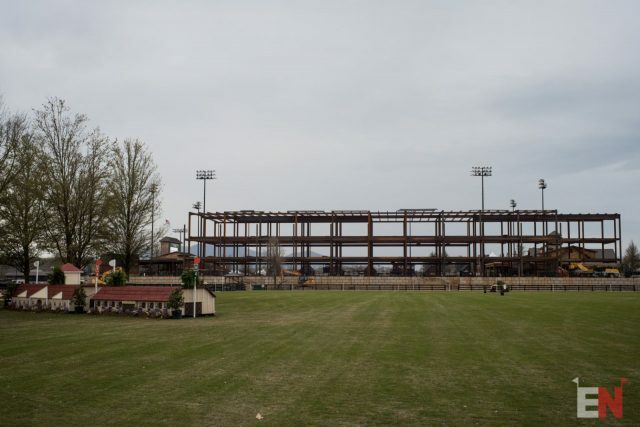 Assembly of the stadium will begin after the USPC Championships East on July 26-29, as the Derby Field currently plays host to a portion of the cross country course at TIEC. 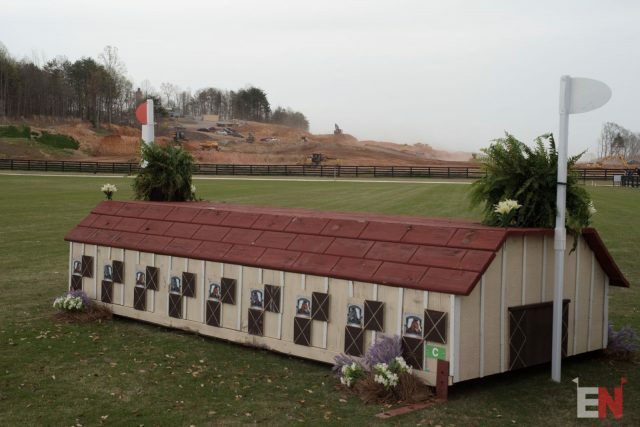 The current Derby Field at TIEC will become the site for the new WEG stadium. Photo by Leslie Threlkeld. Massive excavation work, as seen in the background of these photos, is being done in preparation for cross country, combined driving and endurance. As for all that red clay, the footing will be sodded — money can’t make grass grow faster, but it can buy pre-grown grass. As they did for the WEG Test Event, horses will walk from stabling to cross country, held on the adjacent White Oak property, via a dedicated hacking path. Spectators may walk to White Oak from TIEC or take a shuttle. The cross country course will have three access points with shuttles running from point to point, and there will be two or three hospitality hubs on course with food trucks and beer. On the subject of food, a topic of grave concern to anyone who attended the 2014 “World Queuing Games” in Normandy, the main venue will have a food truck village in addition to TIEC’s five permanent restaurants. Cross country course designer Capt. 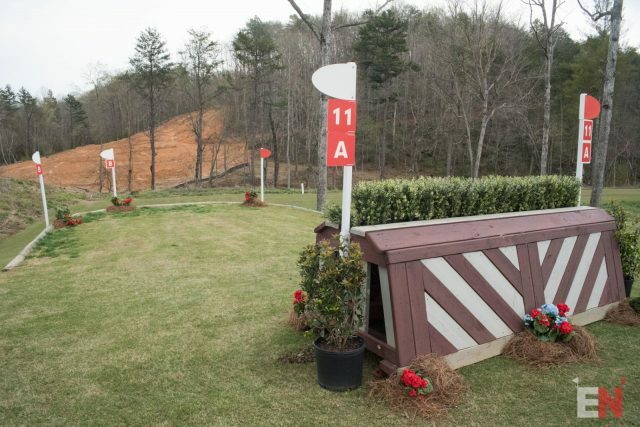 Mark Phillips is playing it close to the vest with regard to what we’ll see out there in September, but there are a few clues — check out EN’s CIC3* course preview from the Test Event here. Having ridden the course, some riders noted that the undulating golf course terrain made making time more difficult than expected, and fitness will be imperative with the course ending on a lengthy uphill climb. We spoke with turf guru Dan Fradley at length about the footing and will be posting a separate report on that soon. Moving back toward civilization, a three-story permanent structure between the Derby Field/future main stadium and the George H. Morris arena will house a media center on the first floor and VIP hospitality decks on the second and third. “Summit Club” patrons will be able to watch the action from both arenas simultaneously. Equine accommodations are in working order and are first-class, with rubber mats and fans in every stall. Designated horse walking paths throughout the venue feature the same fiber footing as the rings. WEG stabling will be by discipline, not by country. EN received reports that some horses stabled during The Fork were agitated by the nighttime construction, even to the point of getting colick-y. There is also currently very limited grass designated for hand-grazing, an all-important stress reducer for horses stabled at any competition. The indoor arena near the venue entrance will host vaulting and reining. 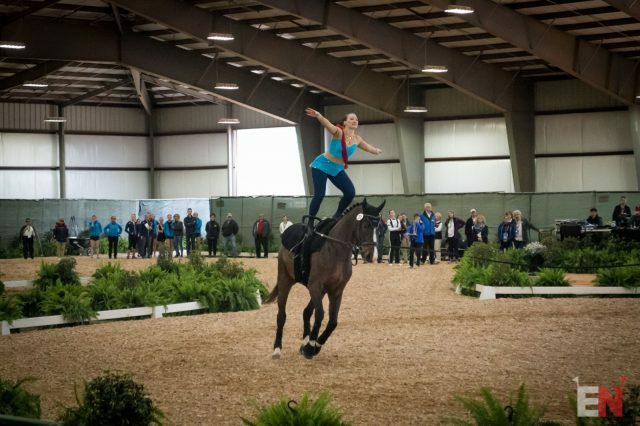 Half of it is functional and hosted the WEG Vaulting Test Eventing, which ran simultaneously with The Fork at TIEC, while the other half remains a work in progress. One half of the covered arena … Photo by Leslie Threlkeld. … and the other half of the covered arena. Photo by Leslie Threlkeld. Beyond the indoor arena and one-bedroom cabins, acres are being prepared for modular athlete housing. 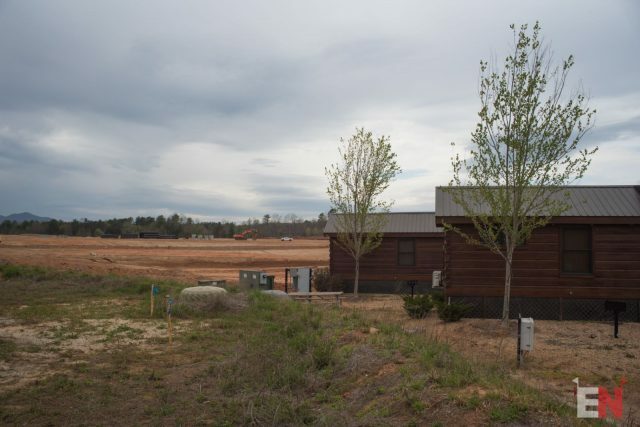 The units are being built off-site at US Precision, a manufacturing plant near Tryon that Bellissimo owns and is using to build the hotel and other resort structures, and will be delivered to the venue at a later date. The original WEG plan included the construction of on-site hotels, but those now seem to have question marks hanging over them. In the event that they are not completed in time for WEG, blocks of area hotels have been cordoned off by WEG for use by National Federations as backup. The Salamander Resort, a luxury sister resort to the original in Middleburg, Virginia, is planned for the White Oak property but will not be finished by WEG. That’s the latest from within the venue itself — although considering the speed at which things are changing around TIEC, they’ve likely changed again since the weekend! We’ll be keeping an eye on the venue in the coming months and will bring you updates as they emerge. Visit the Tryon 2018 website for more information and to purchase WEG tickets.